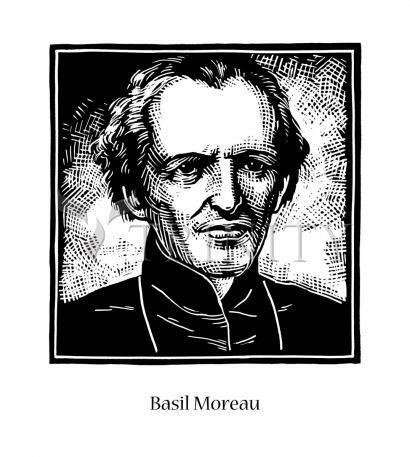 Blessed Basil Moreau was born during the French Revolution in 1799, the ninth of fourteen children in a poor but pious family. He was ordained a priest at age 22, an exception made for his early ordination because of the need to replace the large number of priests killed during the French Revolution. In fact, much of Fr. Moreau's ministry was spent repairing the damage done by the French Revolution, first by teaching in the seminary and later by preaching popular missions to the laity. Responding to pastoral needs, Fr. Basil organized the Auxiliary Priests of Le Mans in 1833 to help diocesan clergy with their heavy workload. In 1835, his bishop requested that he take on the direction of the Congregation of the Brothers of St. Joseph, whose founder was ill and no longer able to lead. In 1837 Fr. Moreau united the two orders into one religious institute, the Congregation of Holy Cross. His feast day is January 20.